This time of the year is not without its challenges, with academic and PASS staff working tirelessly behind the scenes to mitigate any of these towards ensuring a smooth start to lectures on Monday, 11 February. 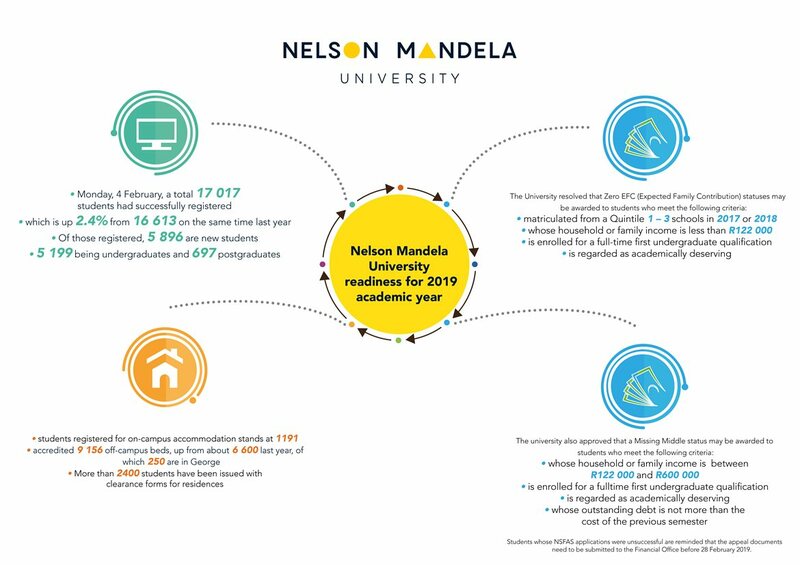 Mandela University, like many universities across the country, is dealing with a significantly increased student population as a result of the progressive model to fund those from poor and working class backgrounds. While government has made significant strides in widening access to higher education, particularly for the poor, resources towards the infrastructural capacity and other supporting measures necessary to accommodate the influx has not been in proportion. 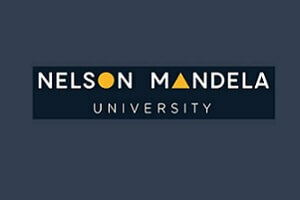 The University, however, is doing its best to ensure that every student admitted to Mandela University is successfully registered, accommodated and afforded the necessary support towards their success. As at the close of business on Monday, 4 February, a total 17 017 students had successfully registered for their 2019 studies, which is up 2.4% from 16 613 the same time last year. Of those registered, 5 896 are new students – 5 199 being undergraduates and 697 postgraduates. In line with the University’s continued efforts towards widening access to higher education, particularly to poor and academically deserving students, a number of concessions remain in place to ensure students’ timeous registration. The University also resolved to make allowances available to NSFAS-funded students within days of registering. These allowances will be disbursed via the IntelliMali system, whose representatives are on campus this week to assist students with the use of their respective allowances. Students whose NSFAS applications were unsuccessful are reminded that their appeal documents need to be submitted to the Financial Aid Office before 28 February 2019. The demand for student accommodation still outweighs the existing supply, creating a greater need for additional, accredited accommodation off campus. A challenge encountered around off-campus accommodation this year is a lack of properties to accredit. Accrediting properties for student accommodation is of paramount importance as it ensures students occupy spaces that are enabling and conducive to living and learning. Residences Managers have reported that to date, the majority of the beds have been taken, and that those that have not yet been taken are reserved for students who have confirmed coming. The number of students registered for on-campus accommodation as at 4 February stands at 1191, with the majority of those registered being first students. Senior students are trickling in and number is expected to rise as the week progresses. The University has so far accredited 9 156 off-campus beds, up from about 6 600 last year, of which 250 are in George. More than 2400 students have so far been issued with clearance forms for residences so far, with this figure set to rise as more students register daily. The Off-Campus Housing Office (OCHO) grants students admission to rooms as they come and in accordance with what is available. A plan is in place to deal with the anticipated challenge of a shortage of properties to accredit as the University has committed to ensure that no academically deserving, funded student in need of accommodation is left stranded. Students who are funded but have no accommodation should contact the Student Housing office for assistance. Protection Services personnel will be on the lookout for any student who may arrive on campus without accommodation, referring them to Residence Managers for overnight accommodation as a means to ensure they are not left stranded. The University is continuously seeking out suitable properties – that meet the government-gazetted national norms and standards for student accommodation – to accredit. The shuttle service will commence on Monday. With new properties added to the off-campus accommodation offering, an updated list will be shared so as to finalise the shuttle schedule, which will be shared with students by the end of the week and placed on the Student Portal. In a bid to help mitigate any initial hiccups with the shuttle service, the SRC has put forward 10 students to assist as marshals at the key shuttle stops. 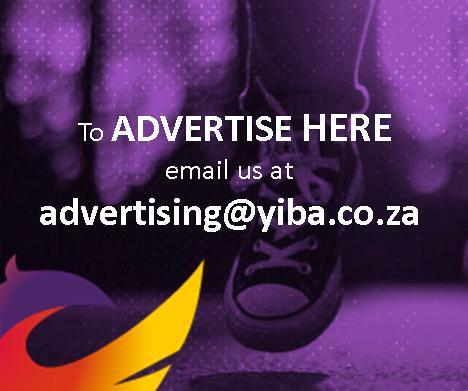 With the anticipated increase in numbers of off-campus students – as the Student Housing office finalises these numbers – about six vehicles are on standby for deployment to the hotspot areas should a need arise. Mandela University continues working with the SRC, as the duly elected student representative, in dealing with matters relating to the welfare of students. The University looks forward to the official start of the academic year and remains committed to ensuring that students are not left behind in their studies. We urge all students who may be experiencing any issues with regards the aforementioned to get into contact with the respective offices as a means towards a resolution. Here’s wishing all our staff and students the very best for the year ahead.